Oral B has a line of toothbrushes that have really incredible features. If you’ve been looking at their options, you know there are many good ones for each handle. It can be a bit difficult to make a decision when there’s a buffet of toothbrushes at a glance. Due to the range of features and benefits, we’ve looked deep into each toothbrush to deliver a focused look. 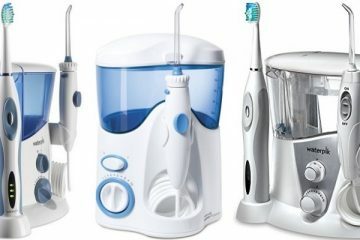 The Oral B 7500 vs 8000. They both have some of Oral B’s latest technology, so you’re getting a fantastic toothbrush either way. They’re two of latest toothbrushes. Many features are the same like the SmartRing on each. We know the dilemma, so this is a deep dive into the features, benefits, and differences between them. By the end, you’ll narrow down exactly which toothbrush to buy. The 7500 has a pressure sensor that ensures you’re not scrubbing. Five cleaning modes for a variety of cleaning needs. SmartRing is visible from 360 degree angles. Timer and Pacer included with this toothbrush. Bluetooth connectivity for tracking brushing habits. One of the standout features for the 7500 is the five cleaning modes. There’s a daily clean that is the standard default for brushing. There is the sensitive mode for gentle cleaning. Gum care is also gentle but specifically geared towards removing plaque at the gum line. The Whitening mode and Pro-Clean are deeper cleaning options with specific goals in mind. The Pro-Clean replaced the earlier models’ Deep Clean options. It actually has a higher power and more movements than the regular cleaning mode. Each of the choices can be seen on the handle when you’re choosing. The SmartRing deserves a mention because many of the other options rely on it. It’s a portion of the handle that will flash to give you alerts. The flash color is customizable, so you can pick one you like. The SmartRing’s illumination is the alert that most of the other features use. In the 7500, you’re getting a timer and a pacer. Dentists recommend that everyone brushes for at least 2 minutes. The timer will count down the minutes, so you don’t have to do it. Each quadrant of the mouth from the top on the right to the bottom on the left has to be cleaned. The pacer will indicate when 30 seconds have passed. You’ll know to switch when it flashes and gives a noise indication. The SmartRing will flash the color you’ve chosen. This toothbrush also has a pressure sensor. You should never press too hard on the teeth during brushing. It’s a habit that people develop when brushing with a manual toothbrush. You’re actually scrubbing enamel from your teeth, which can cause serious dental problems. The SmartRing will flash red when there’s too much pressure. It’ll power down slightly, so you’ll be able to tell that you should relieve the pressure. Once you’ve done so, the pulsation will increase again. The 7500 comes with three brush heads. There’s the CrossAction, FlossAction, and Pro White. They can all be used with their respective cleaning modes. The brush heads will fade when they need to be replaced, too. Brushing your teeth is a means to reduce plaque, which leads to dental problems. The Bluetooth technology helps you track the areas that you’re brushing and leads to better oral care. When people don’t care for their teeth properly, they end up with cavities or worse. There’s an app that can be downloaded, and it’s completely free. It’ll give you immediate feedback on how you’re brushing. Pairs with your smartphone for Position Detection. Customizable SmartRing for coaching and reminders. Pressure sensor to help you avoid damaging your teeth. Six cleaning modes for your choice of cleaning. Premium travel case and charger for USB charging while traveling. The Pro 8000 has a customizable SmartRing. It allows you to choose the color you’d like to see flashing. The illuminated area of the handle is visible at all angles. That helps direct your cleaning efforts. The pressure sensor work hand-in-hand with the SmartRing. While you’ll customize the color of the ring, the alert for too much pressure will flash red. It’s a great indicator for when you’re brushing too hard. Aggressive brushing can lead to serious dental issues with your teeth and gums. In the 8000, you’re getting six cleaning modes. Each mode’s icon can be seen on the sleek handle. There’s the Daily Clean mode for normal cleaning. There’s a Sensitive mode for those who have sensitive teeth and gums. The Gum Care mode is also a bit more gentle than other modes for stimulating your gums. Along with those three, there is a Pro-Clean mode. That mode took the place of the Deep Clean of previous models. It’s for deeper cleaning. There’s also a Whitening mode for a brighter smile. Lastly, there’s a Tongue Cleaning mode for removing bacteria and getting fresher breath. It’ll track your brushing habits. This is information you can take to your dentist to review problems. The Position Detection system is a huge advancement. Instead of waiting for dental issues to develop, you can see exactly where you’re missing areas. Based on the location of the toothbrush and facial recognition software, the Genius 8000 can tell you when you’re missing zones. There’s a timer and pacer if you don’t want to use the tracker. It’ll help you brush for the recommended 2 minutes while hitting each quadrant of your mouth. When you travel, this is a toothbrush you’ll want to bring with you. It comes with a smart travel case that will charge your phone as well as your toothbrush at the same time. Both toothbrushes include the patented circular brush heads. The CrossAction toothbrush has angled bristles. Those bristles function at a 16 degree angle. The round design cups the entire tooth. The angle of the bristles gets between teeth. The FlossAction has varied bristles designed for flossing. The FlossAction can be paired with any of the cleaning modes. Lastly, there’s the 3D white. Inside the bristles is a whitening piece that will shine your teeth for a brighter smile. The 360 degree SmartRing is available in both the Pro 7500 and the Genius 8000. The ring can be customized to a certain color based on your preference. There are 12 color choices for you to choose for brushing. 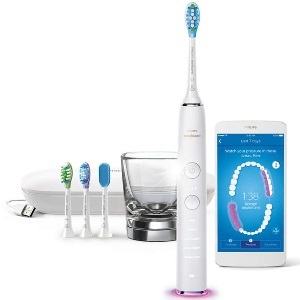 The colors can be programmed into the handle through the Oral B smartphone app. The brushing timer and pacer will cause the ring to flash a color based on your choices. Each of the toothbrushes has a pressure sensor. The sensor will cause the toothbrush to slow down or stutter. This allows you to feel the alert. It’ll also flash the 360 degree SmartRing. The pressure sensor is important for proper brushing habits. This is especially helpful if you’re switching from a manual toothbrush to an electric. The brushing habits you’ve developed over time with the manual can cause issues like overbrushing and gum recession. The 7500 and the 8000 both have lithium-ion batteries. The batteries are fully rechargeable. They’ll last up to 14 days of multiple brushings. Even with Bluetooth connectivity, the battery will last for the 2 weeks. It’s a good idea to fully deplete the battery before charging again. This keeps the battery charging correctly over a longer period of time. That’s true of all lithium-ion batteries for electronics. The timer will count off 2 minutes to ensure you’re brushing for the recommended amount of time. After every meal and before bed, it’s important to brush for 2 minutes to get rid of plaque and bacteria. For the pacer, the alert will happen every 30 seconds. This alert will sound to tell you when it’s time to switch quadrants. The timer and pacer will flash the SmartRing, too. 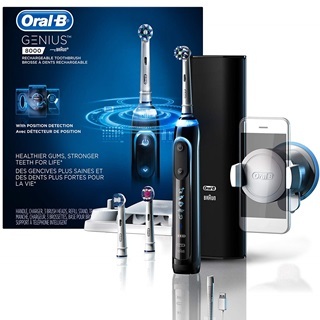 The Genuis Pro 8000 has advancements over previous versions in their Pro toothbrush line. One of those would include the cleaning modes. The 7500 has 5 cleaning modes while the 8000 has an additional mode; the Tongue Cleaning mode. This mode will remove the hidden bacteria, dead cells, and film that can lead to bad breath. Along with removing dead cells and bacteria, the process can improve the taste of your food. It’s a good idea to brush your tongue at least once a day. 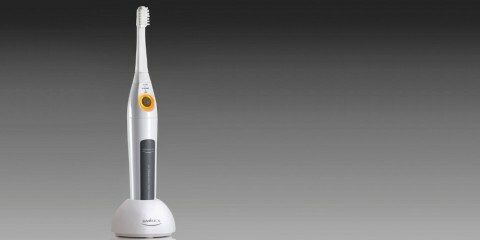 The 8000 has Position Detection for tracking and recording how you brush. Using facial recognition, you can track the exact placement of your toothbrush in the mouth. 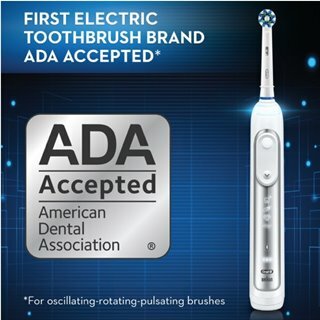 With this technology, it’s easier to track your brushing habits. That information can be clues your dentist needs to figure out why some dental issues are happening. It’s also great for tracking a treatment that the dentist has recommended. For example, you might need to focus more on the back molars. This will track the time devoted to those teeth and help the dentist advise you about your brushing habits. The 7500 has a simple charger and a separate case for travel. The 8000 has a case that doubles as a charger. The toothbrush is carried in the hard case to your destination – whether that’s a trip for work or to the office for brushing after meals. That hard case is where you’ll charge the toothbrush. At the same time, it can also be used for charging your smartphone. There’s a standup charger for holding your smartphone while it charges, too. When you download the app, you’re getting guidance as if your dentist lived in the bathroom with you. The real-time feedback of the Oral B line of toothbrushes includes a Dental Care Journey with the 8000. Each journey focuses on a routine that will match your cleaning goals. You can choose Fresh Breath, Whitening, Gum Health, Ortho Care, or Plaque Fighter. You’ll chose one of these based on your goals. If your dentist has mentioned your problem with plaque, you’d choose the Plaque Fighter journey. 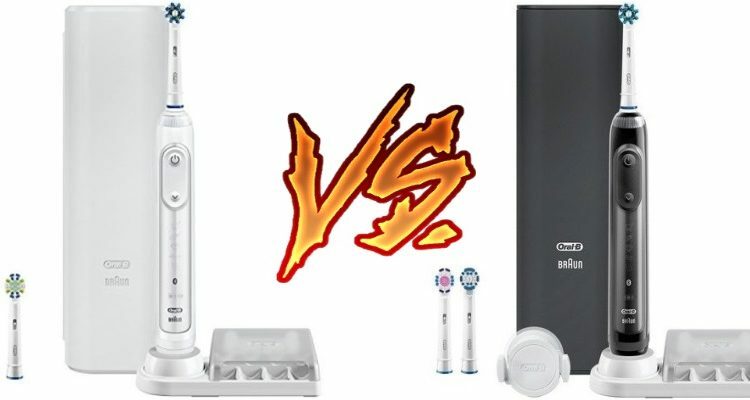 There are only a few differences between the Oral B Pro 7500 and the Oral B Genius 8000. That’s because Oral B has such great products and the latest technology. The advancements from the 7500 to the 8000 mean you’re getting a distinct advantage. The Dental Care Journeys and Position Detection will provide you with tools that give you a cleaner mouth. It leads to better dental visits as well as less cavities and dental work, too. 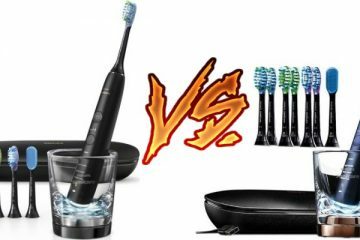 Oral B Pro 3000 vs 5000 : Which is Better and Why?